NYTDA (www.nytda.net) is a private association looking after the rights of the trucking business in New York i.e. the vehicles that deliver goods and services across the five boroughs of New York City – from beverages, foodand electronics to cable TV and internet. NYTDA’s mission is to make truckingand delivery in New York a recognized powerful group of small business people,deserving of greater consideration and respect from legislators, government and the community at large. 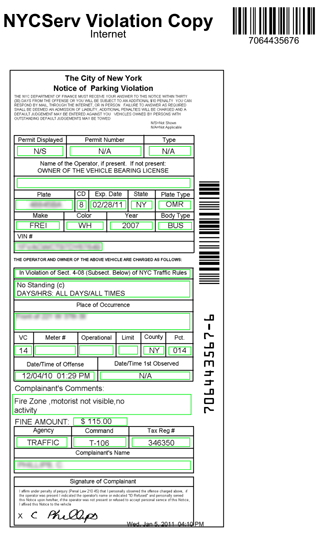 A big part of NYTDA’s undertaking is managing parking tickets, issued to delivery trucks and vehicles, which happens quite regularly due to the pressing character of the deliveries. Having to deal with a large quantity of scanned or electronically generated tickets, NYTDA needed a technology that could extract the tickets data and populate a database for further use. NYTDA entrusted SmartSoft with the development of a customized OCR solution that could solve their challenge. NYTDA used Smart OCR SDK’s template functionality to automate the locating and recognition of the data. Different templates were created for the various document layouts, with the text regions specified for each template. The software then automatically found the corresponding template for each processed image. In this way, the applications could automatically perform OCR and extract the necessary information accurately, without the need to manually specify the location of the data on the form. The templates provided dynamic location of text regions, so the regions were properly located even if the document was moved, rotated, or zoomed during scanning. Automating the tickets’ processing was a great assistance for NYTDA as it offered easy access to the documents data as well as minimizing human time and error. NYTDA was pleased with the results, allowing them to better serve their business community. Ken Thorpe, Chairman & CEO of The NY Trucking & Delivery Association commented "NYTDAIt was a pleasure working with SmartSoft. Everyone from the sales staff to the developers was hands on and responsive to our every need. The solutions needed were understood and executed timely and professionally." More information on NYTDA is available at www.nytda.net.